My iPhone said it may rain. My iPhone was very, very wrong. The sun shone its glorious face over the entire day. I met Enrico at the school at our usual time. 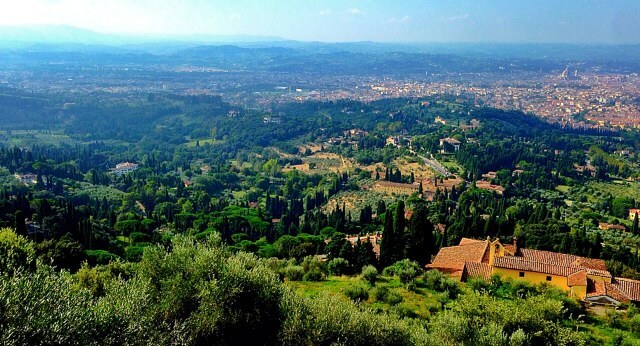 I asked where we might paint today; Fiesole was the answer. I’d only read about it, but what I read was inviting. 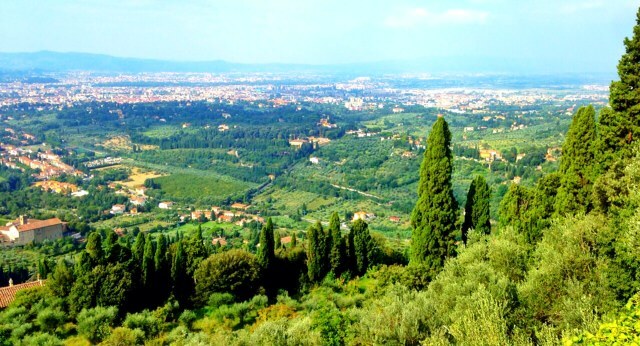 Far above the city, this little town is older than Florence, founded originally by the Etruscans for its stunning view of the Tuscan valley below (which is now Florence) and its cooler temperatures. It’s just so very refreshing to be in a place where art matters. I would never ever have to explain to an Italian the importance of art. And so here I am, surrounded by it. We spent the morning painting the view of the valley. The theme of our lesson was similar to that of the last two days: patience. Yes, yes I’m working on that. It took Michelangelo four years to complete the David. Yes, patience and art do go hand and hand here. It’s good for me. As a hyper-productive American, I feel I have to have much to show at the end of the day. 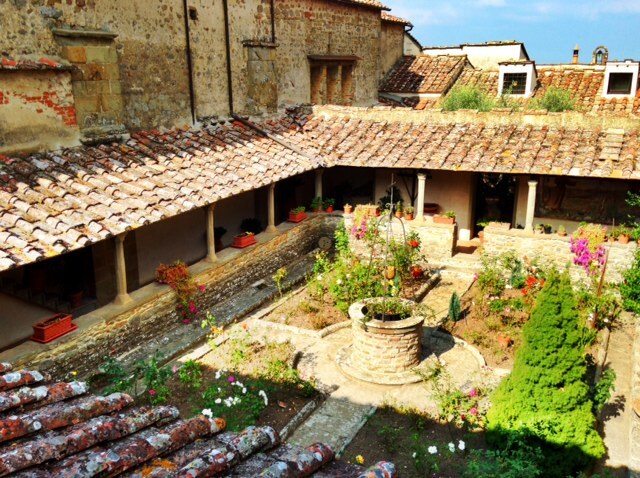 You have heard something like this from every American who spends any time in Italy: “They just enjoy life more.” Hyper-productive is not what you call Italy, yet here I am, growing and learning, so maybe patience and slowing down are productive after all. 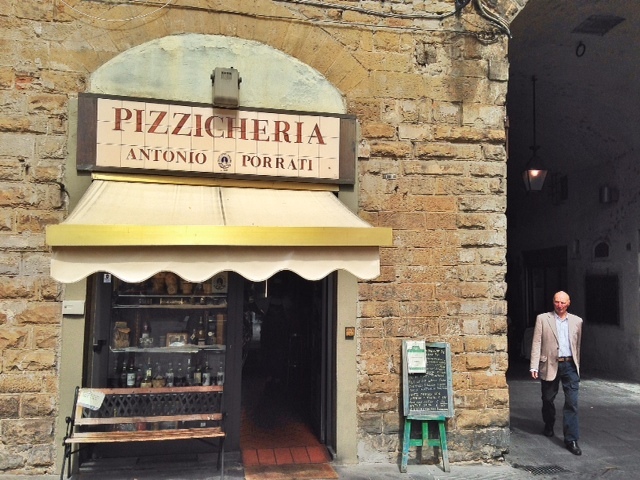 I ask this one question of any Italian whose ear I can bend, so I asked my teacher Enrico, “Where is the best food in all of Florence?” His young eyes lit up and he said, “Ah, I will show you.” He went on to explain the jolly owner who knows the source of everything in his place. All local, all delicious, all cared for by the most beaming man in Florence who owns this joint. It’s adorable, but not an ounce of fancy here. I can’t remember everything we ate for lunch; something like a paella. A fish pasta, marinated zucchini and artichoke hearts, all selected from the deli-type counter where it was all on display. Served with a local white wine I will have to get the name of, as I’ll be back. The wine was served in a plastic cup which normally might do me in, but the great energy of this place, the taste and enjoying it all outside at the tiny little table, under an arched walkway — sigh, yes, I don’t mind. Life is good, and I’ll be back to this place. Here is a photo of it. At the end of the journey I will make a list with street names called “if you go,” for I can’t keep all this goodness to myself. After lunch we did some more sketching, and then it was time to part ways. Enrico has been a fine teacher this week, but next week I will study another passion, art history, and have a new teacher. Thank you, dear, sweet Enrico: For such a young man, your talent is astounding and your kindest and patience so appreciated. 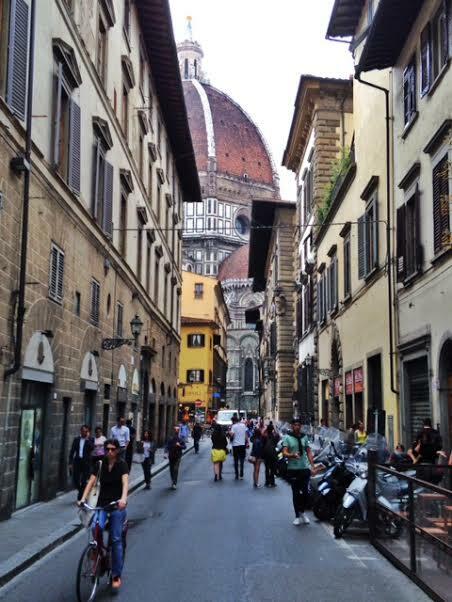 Enrico had taken me to a library just beyond the Duomo with a rooftop cafe with a glorious view of the Duomo itself. I stayed on a bit to finish sketching and just be alone with my thoughts for a bit.